I love sandwiches and I love pork. So it was only natural for me to check out Porchetta‘s namesake sandwich, which is the top 10 of New York Magazine‘s list of 101 Best Sandwiches in New York, and devoured with abandon over at Serious Eats: NY. Pork and carbs are a natural WIN, but would this sandwich live up to its hype? I was about to find out…. ….but onto the moment you’ve all been drooling for – the porchetta sandwich. Served on fresh, crusty ciabatta, the pork is salty and fatty, complete with crispy pieces of skin (my personal fave). The sandwich looks big enough for two; however, I took one for the team and finished it on my own – big sacrifice, I know. All too soon, the sandwich was history. 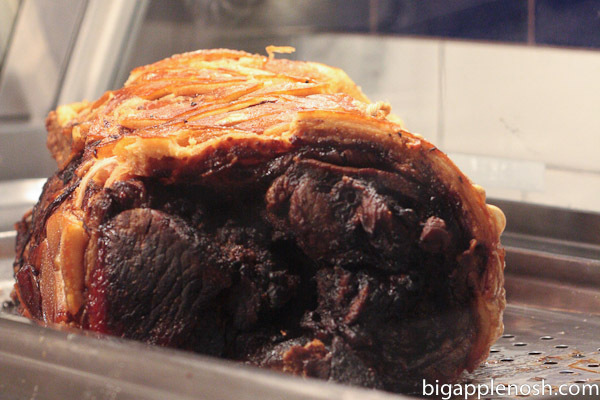 The one thing I wish was slightly different was that some of the pork skin was too tough to chew through – a disappointment since I love crispy pork skin! However, an eating buddy has tried the Porchetta sandwich on a different day and the skin was perfect. I’ll obviously need to give the sandwich another try. 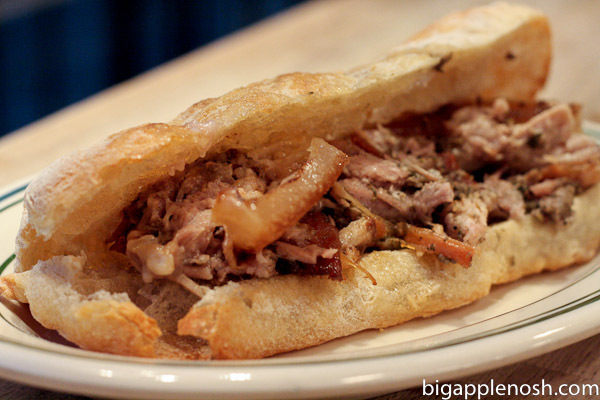 The porchetta sandwich – a study in porcine goodness. Check out Twitter for schedule updates! I freakin' love the fatty skin on pork and duck. You make my mouth water every single time! Wow, that looks so good..well that is not a word, looks fantastic! oh holy cow that looks good. 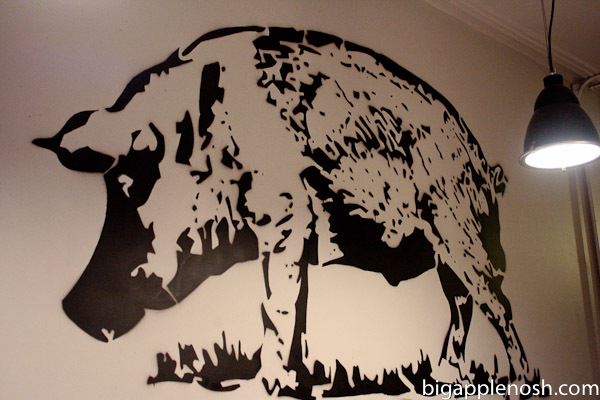 or should i say holy pig. After four days of turkey, this sounds amazing. Crispy skin is a must, hope it's better next time you go! 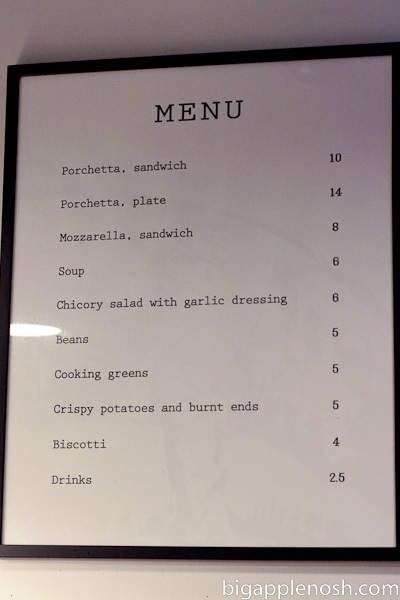 porchetta sounds so cute. like a little piggie. crying wee wee wee all the way into my stomach. Oh, my stomach just growled as soon as I read" cripsy potatoes and burnt ends." Must. Eat. Pork. Soon. 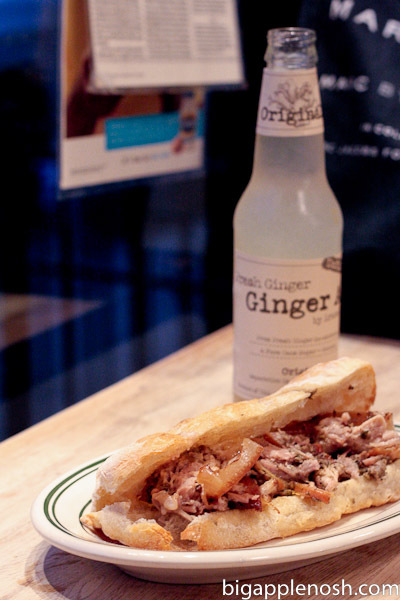 that ginger ale by the sandwich looks DEEELISH! I love their Porchetta Sandwich and the crispy potatoes! Porchetta is on my street, so it's tough to walk by and not want it all the time!! Found this through weddingbee and I'm hungry already! I'll definitely have to check this place out when I'm back in NYC. I've been meaning to go there. Wow…just wow..
WOW, this is my next stop when I visit New York! Holy moly – this looks insanely good! 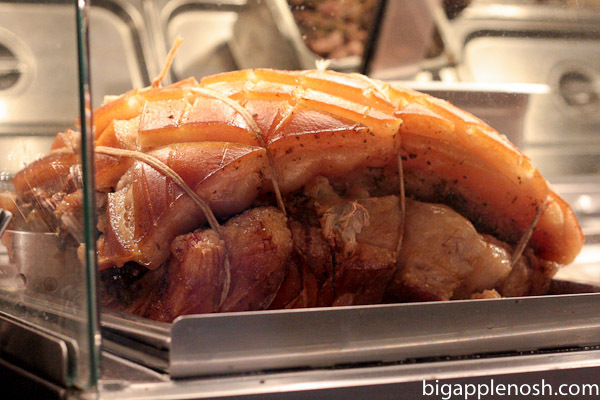 the porchetta in all its glory made my mouth water!! OMG, that sandwich looks amazing!! 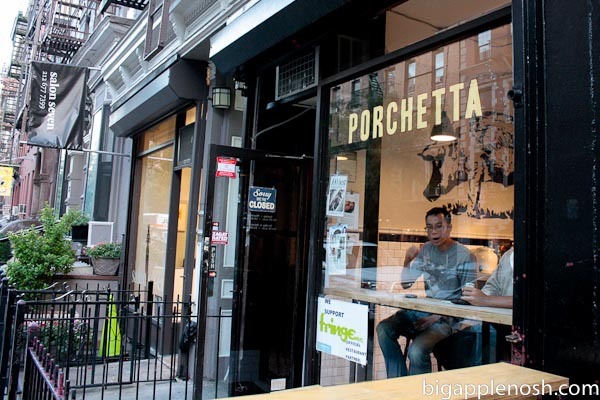 I am putting Porchetta's on my NY Must Eat List! !